Let the Hardy Motor Boat Owners Club help you buy or sell your boat or boating gear. Buy or sell your boat or gear with the Hardy Motor Boat Owners Club. 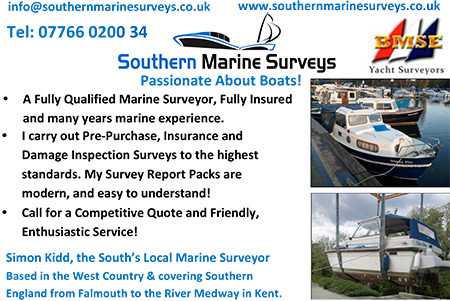 If you are looking to buy or sell a used Hardy boat of any type - Navigator, Pilot, Regatta, Hardy25, Commander, Fisher, Hardy Motor Sailer, Hardy Seawings etc, then the Hardy Boat advertisements on our website are read by our many dedicated Hardy Owners Club members and other Hardy enthusiasts. Our fastest sale was within one day of advertising! 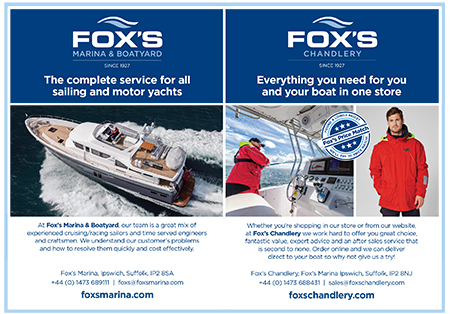 Advertisements can include a photgraph of the boat and are on our web site for up to a year and in the 3 issues of our own magazine, The Hardy Owner, sent to all members each year. Simply do it from here. Hardy Navigator with 2 berths, 5.42m, 12v battery with fitted solar panel charger. Depth echo sounder, re-covered internal seating, gas cooker, toilet. 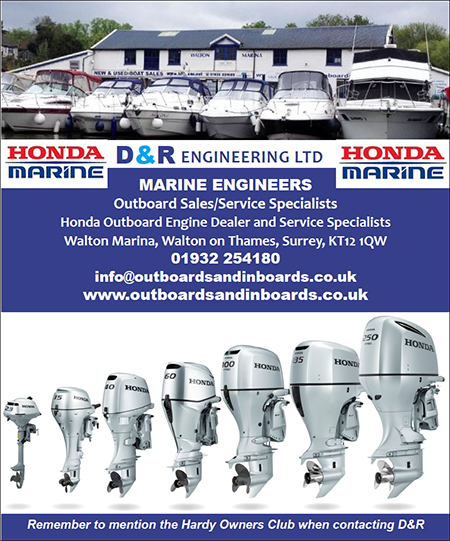 3 fuel tanks and fitted with outstanding Suzuki 50hp 4-stroke engine with approx 25 hrs running time, fully serviced April 2019. Hull polished and anti-fouled April 2019. Road trailer in good condition with storage paid until Sept 2019. Multi-channel VHF radio and 7'' Standard Horizon chart plotter with maps. Hardy 21 foot M/S, twin bilge keel, GRP, displacement motor sailer with wheel and tiller steering, a remodelled cabin for twin berths, ample storage, over 6 ft. high, main cabin, with a Volvo 2002 18hp diesel driven Sonic through hull mounted drive leg. With its traditionally positioned comfortable separate new heads. Rewired and new upholstery 2017. With Magnetic Compass, depth gauge, automatic pilot, solar panel serving aux battery. mains electric hook up, magnetic automatic tiller pilot. Auxiliary outboard bracket. Reupholstered full length twin berths, with storage under, 2 gas rings with built in bowl and hood, built in storage cupboards. Popular pocket cruiser, ideal for Norfolk Broads, inland waterways & estuaries. 2 berth, galley area with sink and camping stove, refurbished Jan 2018. 9.9 four stroke yamaha electric start outboard, fuel tank, new propeller & impeller. Serviced, new oil & fuel filters Nov 2018. Starter & domestic batteries. New emergency outboard bracket. Navigation & cabin lights, windscreen wiper, echo sounder, fire extinguisher. New fenders & warps, anchor & chain. Comes on its own SBS trailer that tows very well. Good tyres & over-run brakes, wheel clamp, new ratchet straps. Lovely condition for year & ready for season. With 60hp Yamaha and 5hp Mariner (both serviced 2018). 3 main petrol tanks with smaller one for aux. New hood 2018. Fitted stanchions & lines, mast and 4th berth conversion. Sea toilet fitted with additional porta-potti supplied. Instruments and compass, anchor, lines, fenders and spares. Original and looked after boat with low hours of use which has been river only for last 20 years, BSS to April 2021. Wintered out of water ( and covered) on twin axle galvanised trailer which is also supplied. As owner is retiring,full inventory is included to launch and use upon delivery which is offered free in England/Wales. Now sold, but if you have a boat to sell then your advert could be here for just £15.00 (HOC members) or £20.00 (non-members). Please click here to place your advert. FOR SALE: HARDY FAMILY PILOT 20 (1991) "Colombard"
�Colombard�, with 50 HP Honda 4 Stroke Engine (New 2007), regularly serviced, aux bracket, trim tabs. 2x25 litre and 1x30 litre fuel tanks, 2 Batteries with change-over isolators, Nav lights and spot light. Galley St.St. sink with pumped cold water with 25 gal tank, 2 burner hob & grill. Chart plotter, Fish finder, log & depth sounder, compass, VHF radio, fire extinguisher and fire blanket. Separate WC with sea toilet. 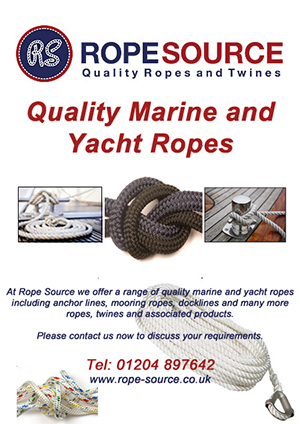 Stanchions & lines, anchor, chain & rope, mooring lines, fenders. 4 wheel trailer, (overhauled 2017). Build No 2293 Newly painted hull in Oxford Blue. Two Outboards: Mercury EFI 60 HP with power tilt and steering, Yamaha 6HP auxiliary. Quarter berth removed and Galley with Plastimo SS Cooker & Sink + water tank moved inside. Two new folding and swivelling seats fitted to cockpit. Nauticover Acrylic Canvas Awning fitted 2016. Toilet compartment with chemical toilet. 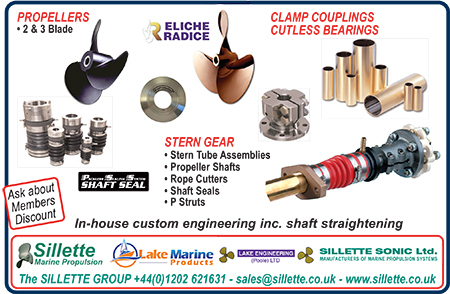 Electric & manual bilge pumps. New Starter Battery Good Leisure Battery, both charged from solar panel. Navaids: Garmin 100i VHF, GPSMap551, Fishfinder 400C, Navman Log. S/S Swim Ladder, 4 Man Inflatable Dinghy. Fully Refurbished Trailer, 30 road miles, never in water. Full set of Fenders and mooring lines, anchor, tables etc. More pictures & details from seller, prefer email communications due to poor mobile signal. Sold: Hardy Bosun 20 - "Moonlight Mr"
Nice example of this rugged 20 foot cruiser built 2000. Favourable marine survey report 2016 - little use since then due to illness. The Bosun is similar to the River Pilot but with the inclusion of a full bulkhead on the port side giving greater rigidity. The Bosun features stainless steel rather than teak grab rails. 50HP Mariner 'Big Foot' 4 stroke with Power Tilt. 2 x 25 litre fuel tanks. Regularly serviced . 6 HP Suzuki outboard auxiliary mounted on cantilever transom bracket � only one to two hours use running in. Sink; 2 burner hob; Geonavs navigation system, Icom VHF radio; canopy, ropes and fenders, toilet compartment with Portaloo, navigation lights, anchor and chain, main and auxiliary (leisure) batteries with isolator switch. Hardy Mariner 25: we have totally refurbished this craft at our works and she is 'as new' . Over �7000 spent on Yanmar 4LH.FTE engine and gearbox rebuild alone. New Turbo, injectors ,ignition hub etc etc. All usual extras, heating satnav, shore power, bow thruster, vhf.....first serious buyer to view will jump at this craft. Lying ashore at our Southampton marina. FOR SALE: Hardy 20 Motor Sailor - "Celyn y Mor"
Hardy 20 motor sailor. Mast, sails and full canopy included. This boat has been undergoing a refit, exterior almost complete, hull and gelcoat in very good condition, includes brand new rope fendering. Interior still requires some tidying work. Originally outboard driven, a 20hp Yanmar inboard and stern gear have been fitted and the boat has been afloat with this set up prior to refit. The trailer pictured belongs to the boatyard and is not part of the sale. The boat has been left for sale by the owner`s family. 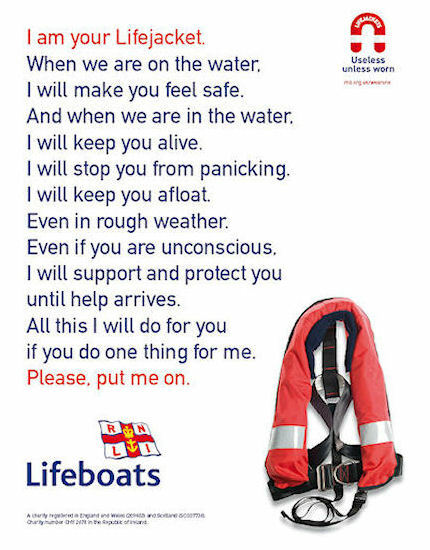 The boatyard are happy to give assistance where required. More pictures and description can be emailed to interested parties. Also advertised in the local marina. FOR SALE: Hardy Family Pilot 20 "Big Mack"
"Big Mack", (build number 1126) is in excellent operational condition following extensive works over last few years. New canopy 2014. New curtains and interior headlinings/cushions and Hardy rope fender 2015. New wooden seats for cockpit 2014. New Marina Four Stroke 75hp (2017 Model) outboard with electric tilt (Only 20 hours so far) top spd 22kts , Mercury F4 auxiliary - transom mount (Approx. 10 hours only). New hydraulic steering. 3 x 25ltr fuel tanks. RPM and tilt gauges. Ratheon 1000 Radar, GARMIN GPS, VHF, Compass, electric bilge pump, fog horn, nav lights, two 110amp batteries (2017), fire blanket, 1 extinguishers, 2 CQR anchors, 10m chain + rope, mooring lines,Fenders, Propone Plastimo cooker with grill+ Kettle(New 2015), Plastimo Water tank + deck filler. Seaglaze aluminium windows throughout. tidal clock, waterproof FM radio and MP3 player with waterproof speakers. 12V TV fitted in cabin. Currently moored in the marina, was antifouled and re launched August 2018. FOR SALE: Hardy Family Pilot "Jura Pilot"
Well known for circumnavigation of GB in 2003, Jura Pilot is a very seaworthy, long distance coastal cruiser. 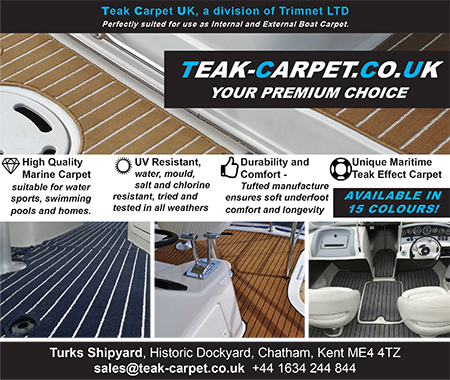 Big summer refit - superb, fully operational condition. New canopy. Honda 75hp (2006) outboard with electric lift, Yamaha F4 auxiliary - transom mount, �Lectrotab� trim tabs. New control/steering cables. 100ltr fuel tanks, new fuel lines + reserve tank for the Yamaha. 10 hours since engines serviced. Fuel, RPM and tilt gauges. Radar reflector, GPS integrated ICOM DSC 100 controller, ICOM M401 Euro radio, compass, Nasa GPS repeater, new Garmin GPSMAP 751 plotter, Garmin Echo 201 DV fishfinder, Navtex weather, new Duet log and depth, bilge pump, fog horn, nav lights, LED fog light, two 110amp batteries (2016), fire blanket, 2 extinguishers, Bruce anchor, chain + rope, mooring lines, Plastimo cooker, water tank + deck filler. Seaglaze aluminium windows throughout. Brass clock, barometer, tidal clock, Bluetooth amp. S/s swim ladder. Superspeed road trailer. Lady S is currently my father's pride and joy and is an immaculate example of a Hardy Regatta 19. She has been fully restored with no expense spared. Its primary engine is a Yamaha 70HP Auto-lube with a Suzuki 8HP Auto-lube back up. Each engine is powered through a primary and second fuel and ignition system. The boat will be sold with GPS, Anchor, Life Jackets, Fish finder, Ship to Shore VHF, emergency VHF & a selection of compasses. The boat is equipped for two berths with Galley, fresh water tanks & a brand new cassette toilet. This boat has a few luxury touches, with central heating and CD player/radio. Although currently moored, we are including a double axle trailer within the sale. Although we are based in the North East, we would be happy to arrange either a courier or we could deliver at cost. FOR SALE: Hardy 25 "Demelza"
Demelza is a good example of the popular Hardy 25. She is a 1983 build in GRP, with 2 double berths, Galley: 2 burner hob with grill, Stainless steel sink with H & C pressurised water. Heads: Porta Potti and Shower. Powered by Volvo D3-130 (130 hp) with SX out drive (2008, last serviced 2018). Equipment : VHF/DSC Horizon Radio (2016), Garmin Striker 4 Fishfinder (2017),Garmin Map 550 GPS Chart plotter, NASA Marine Log (Non-functioning), Compass, Barometer, AM Radio/Tape player. Safety Equipment: 3 x Fire extinguishers (2016), Fire Blanket (2017), CO Monitor (2017). Horseshoe Life buoy with light (2017). Other: Anchor (CQR) with chain and rope, Windlass, Anchor & Navigation Lights, Horn, Warps, Fenders, Inflatable Dingy, Mariner 4 outboard motor (serviced 2017). 2018 work : New canvas cockpit cover,canvas cockpit hatch cover, cockpit head lining. Jabsco sea toilet, replaced with Porta Potti cassette toilet. Redundant fittings and old handrails replaced.New anodes & anti-fouling. 2017 Galvanised 2 wheel Snipe road trailer to full EU spec.Set up for Hardy 20 which is now sold. Near new condition. � 2000. Chichester area, but can deliver. Designed by Colin Mudie and built by Hardy Marine in 1986 for the 1987 Boat show Pleiades is an excellent example of the very popular Hardy 25. 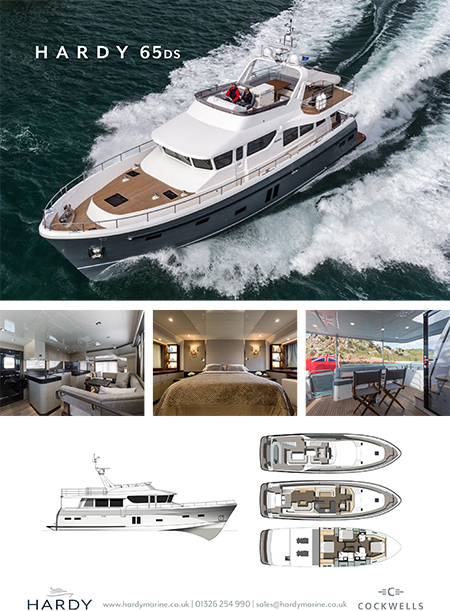 She has 4 berths in total comprising 2 double berths and is powered by a Cummins Mercruiser 1.7 inboard marine diesel engine delivering 120hp through an Alpha One sterndrive.�She has received a full mechanical and electrical service in 2018. "Pleiades" was totally refurbished internally in 2016, including all re-upholstering, new carpets, rear deck seating and curtains. There is also a new electric toilet. Galley has a sink and 2 burner plus grill cooker. Electronics include a Garmin GPSMAP 400 series Plotter, Lowrance Hook 4 Plotter/Fishfinder, 2 DSC VHF radios and a Combi TV. Also included is a suitcase quiet running generator and spare cockpit cover. Separate from the sale but open to negotiation is a new purpose built road trailer and a New Mercury 6 HP 4 stroke auxiliary outboard. Sold: Hardy Commander 32 "Cuan Lady"
Commissioned 2000, Cuan Lady has been very well maintained. Twin engined Yanmar 250HP Diesel engines. 4+1 berths in 3 cabins, Eberspatcher warm air heating. She has many extras such as a "clear view" storm window, bow thruster, Raymarine tridata; new VHF, dept and "see me" radar. Autopilot. Insulated water heating from shore power and engine cooling system, Large electric operated glass, operated sunroof in main saloon. Twin seats at helm. Electric winch anchor 40m marked chain. New solar panel management system and batteries all sound. Gas alarm and 6 fire extinguishers [2 auto in engine room]. Cruising speed 17 Knots, max speed 24 knots. Winterised and serviced every year on land. Many other features, including 4 man tender with platform davits and outboard motor. 4 man life raft 2014, and 2 extra bronze propellers .Full specs and photos to potential buyer. Reason for sale - human age & health, hence lowish engine hours.This iconic boat needs a new enthusiastic owner. "Morning Star" is a 4 berth Hardy 25 (1985) in nice condition: 26' overall length. Economical Volvo 2003T (43hp) diesel to Enfield Outdrive, both fully serviced, and antifouled November 2017 with new gaiters on out drive. Engine starts and runs well: 6 kts cruising, 8 kts max speed. I have just de-rigged my Hardy 18 motor sailer and would like to sell the rigging . 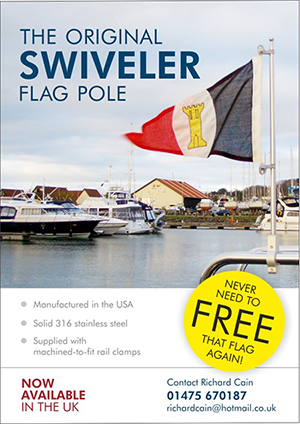 This includes the mast, roller furling, stays, jib and tan mainsail. All in reasonable condition and pretty much ready to re-assemble. Not sure as to value so open to sensible offers . Collection only. Based Co Durham. Tel 07443549352. Hardy 20 Pilot 1996 md 22 Volvo diesel with only 360 hours since the boat was new ,in excellent condition. Like new, stored in a commercial garage in its own bay making this boat easy view; on a heavy duty 8 wheel boat dolly, which is included in the sale. She has own water supply ,stainless steel sink tap, lockers under the sink. The wheel house has been fully enclosed as factory build; both hatches have been replaced with aluminium and glass strong lockable hatches. The cabin rear has been decked out in wood. There�s an ancillary engine mount and ladder fitted, it has stainless steel rails around the boat; a radar arch spotlight, Bruce anchor, new radio and full set of fenders; stainless, gps, plus loads of other extras, far too much to list here. The owner has been a Hardy enthusiast and member for years and can send more photos from his email "miatig77@gmail.com"
2 berth. 5.42m loa. 2.2m beam. Draught 0.6m. Plough anchor with about 20m chain and rope. 12v 60Ah battery with isolator switch. Nav lights. Clipper Echo Sounder. Electric horn. 12v power socket. Manual bilge pump. Removable cockpit benches. Cabin and anciliary cushions. Curtains. Cockpit table over outboard well. Fenders, warps, boat hook, four x 5L petrol cans. Original Hardy Marine manual and receipts from first registration 1986. Unopened 5L tin of antifouling. Evinrude E Tec 50hp. Model E50DSLSC. 2008. Manufacturer�s instrumentation. Some blemishes, but hull and superstructure in good condition for age. Common Hardy issue of fading of gel coat - a good polish at the start and half way through the season keeps it presentable. Rope fender is functional but not pretty in places. Optionals:. XM 2.3m inflatable tender. �150. Auxilliary Evinrude 8hp long shaft 1986. �150. Short distance or yard trailer. Recent bearings. �150. Please be aware that whilst every effort is made to ensure that all adverts on this page are up to date it is possible that a craft has been sold since this page was last updated. Please advise us if your craft is sold and we will then update this page as quickly as possible.